How to get the golden egg without disturbing the hen? This was a typical conundrum posed by Indonesia’s fourth President, the late Abdurrahman Wahid. Better known as Gus Dur, he was one of the nation’s most prominent theologians, a committed democrat and lover of metaphors. One of the eggs was reform and a return to the more accepting indigenous Islam. This needed to be secured without arousing the wrath of the broody bird, the rigid Saudi form known as Wahhabism that was becoming popular. Gus Dur died in late 2009 aged 69. Before entering politics he was head of Nahdlatul Ulama (NU), the biggest Islamic organization in the world. His 19 months as President between 1999 and 2001 were chaotic after the fall of the long-time dictator and former army general Soeharto. Gus Dur was a bad economist, a lousy administrator, a decent humanist and a good social reformer. He lost the top job after being threatened with impeachment. There aren’t too many NU members who do not have an anecdote about their former leader. Apart from being a religious scholar, the polymath was also a passionate soccer fan and all-round funny man with a sackful of jokes. He used these to start meetings and defuse tensions. A Madurese man was caught ignoring a sign banning pedicabs. “I saw the picture sir,” he told the policeman, “but it showed an empty becak [pedicab]; mine had a passenger”. One of Gus Dur’s favorite verses from the Quran reads: “I have made you nations and tribes so that you may know one another” – a robust rebuff to the parochialism preached by today’s separatists. He wrote essays and newspaper articles until he was restricted by the loss of sight; these were always in Indonesian though he was a self-taught polyglot. Now the Gusdurians – the young followers of his liberal thinking – have offered some selected works to a wider audience. 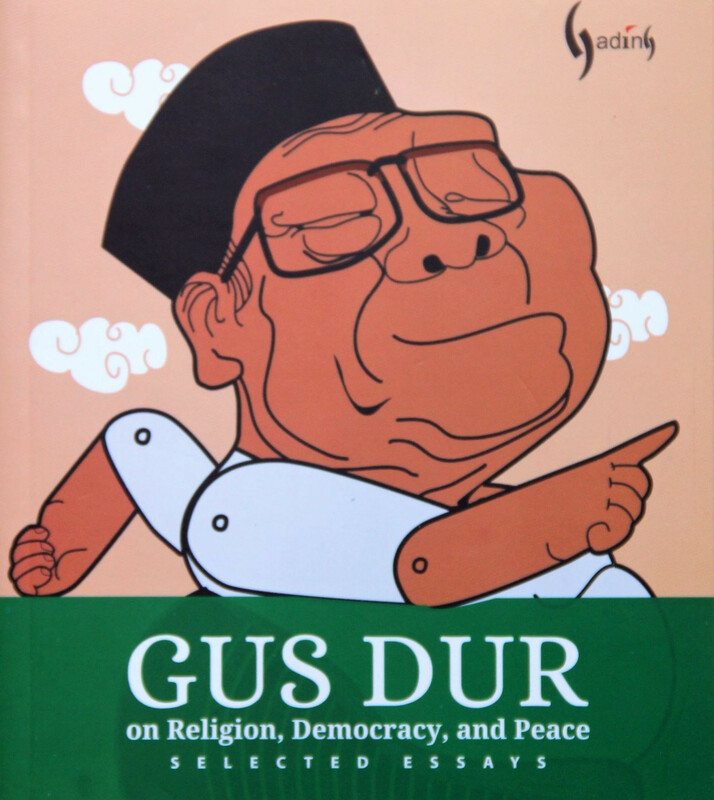 Seven translators have put 13 of his essays into English as Gus Dur on Religion, Democracy and Peace. Behind the book are the NGOs the International Forum on Indonesian Development and Islamic and Social Studies Institute. The ambition of giving their hero’s wisdom to the world is fine and the book important, offering many stimulating observations. But sadly it will be rejected by some potential buyers put off by sloppy English, even on the back cover blurb: “Not much people know that Gus Dur wrote many reliable and high-quality articles […] [he] does not simply reject negative ideas about Islam, he also proposes and advocates positive ideas about on the other hand”. We get the gist; Gus Dur’s fans will read this book anyway and forgive the errors, but the public expects quality English. The uncommitted curious will put it back on the shelf. Two proofreaders are listed in the credits. I doubt they read the book. However, the rest of us should, if only to lift our spirits, to remind us of the complex diversity of Islam, a faith so often portrayed in the West as violent and intolerant. His conclusion was positive – though this was before urgers for a caliphate donned suicide vests and rode into crowds: “The richness of [Islam’s] heritage from its deep perception of a true place for humanity in life, to its great tolerance, make a strong base for the Muslims to sail through the revival process”. These are qualities we need now. Gus Dur’s second daughter Yenny Wahid is a prominent public figure helping to maintain her dad’s legacy. But at the moment there’s a dearth of dynamic elders from outside the family offering the world a counter view to the ugliness of demonstrations against those of other faiths. Into the gap have jumped the myopic polemicists. What might Gus Dur have said to supporters of the so-called 212 Reunion in December for instance? If true to form, he would have condemned their celebration of getting the ethnic-Chinese Christian and then-Jakarta governor Basuki “Ahok” Tjahaja Purnama jailed for blasphemy. This law has been erased from the statutes of most modern nations; it’s better covered by prohibitions on individuals deliberately and maliciously causing egregious offense, and not just against faith. The black-banner wavers around Monas have struck fear into the hearts of Indonesia’s minorities and dismayed the Republic’s foreign friends – something Gus Dur would have opposed with conviction. He wasn’t just a thinker – he physically confronted crazed mobs who’d caused fires at churches. His essay The Republic of Earth in Heaven: Another side of religious motives within social movements, written 35 years ago is apposite today. He warns of “an endless process of fragmentation […] diversity sacrificed to revolution”.